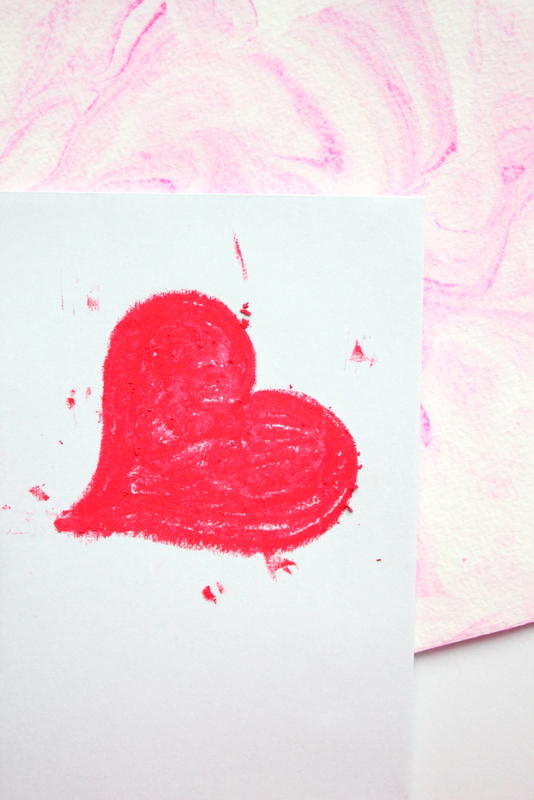 DIY scented marbled paper: Show your love this Valentine's Day! Valentine’s Day can be everything from amazingly romantic, lonely, annoying, special, a day like any other, or materialistic and wasteful depending on how we spend it. When it comes to gifts for Valentines the choices range from super cheesy to truly unique and lovely. We all prefer the latter, of course. I especially love gifts that make the person I am with (or myself if I am single and gifting myself) feel special and that express how unique and precious they are to me. 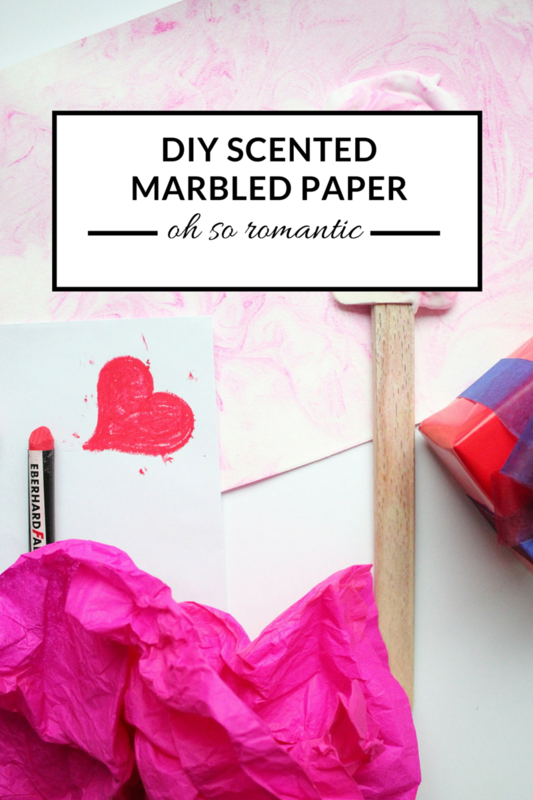 So this Valentines I’ll share one of my all-time favorite diy projects and you will be amazed at how easy this one is: DIY scented marbled paper. Romantic, affordable and easy: My kind of gift! I have love marbled paper since I was a little girl and the whimsical patterns on it are my favorite. I remember when I was in kindergarden our teacher showed us how to make it using a water tray and some oil colors or some other mixture I can’t remember the name of. What I do remember: it was very easy to make and I loved the sheets of paper I created. I used them for letters to my girlfriends, so happy and proud that I had made them myself. 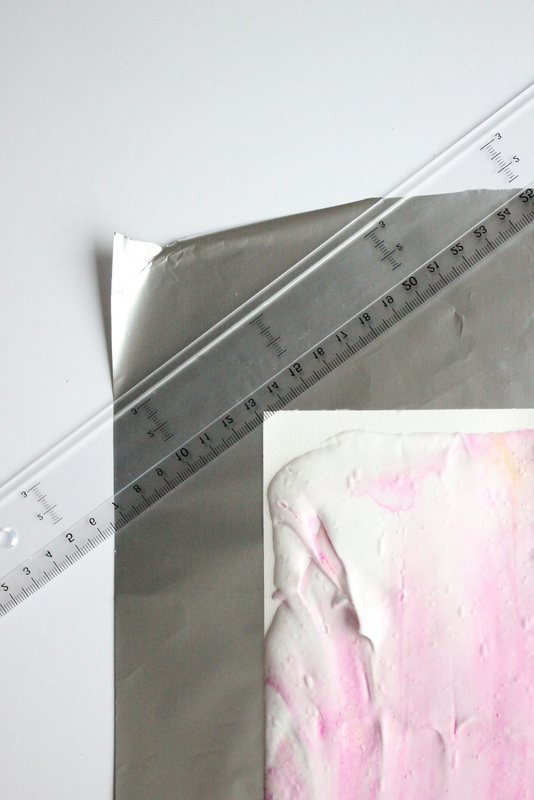 So when I went looking for a tutorial on how to make marbled paper on Pinterest last year, I quickly grew disillusioned because they all involved either really expensive materials or the results looked nothing like what I had in mind. I was looking for very soft tones, pastels preferably, and a marble that is very feminine, subtle, not too strong in contrast. Most of the tutorials weren’t delivering on the feminine color palette or the degree of easiness and affordability I was looking for. 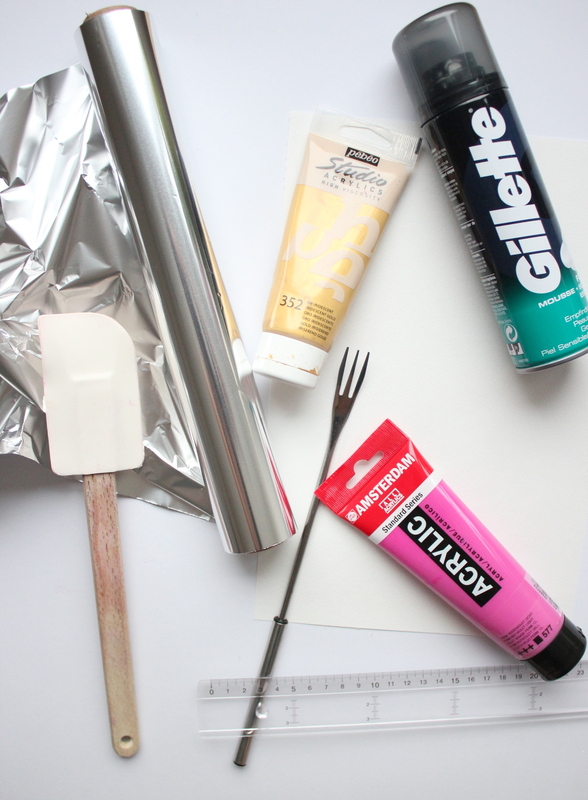 Until I came across this tutorial from eHow on how to create marbled paper using shaving foam. I had most of the materials at home already, except for the gel food coloring, which turned out to be a good thing. I substituted the food coloring with acrylic paint and it worked just great. Acrylic paint comes in many more shades than food coloring, is quite affordable and can be used for all kinds of crafting. Most importantly, I had my favorite shades at home: gold and pink. 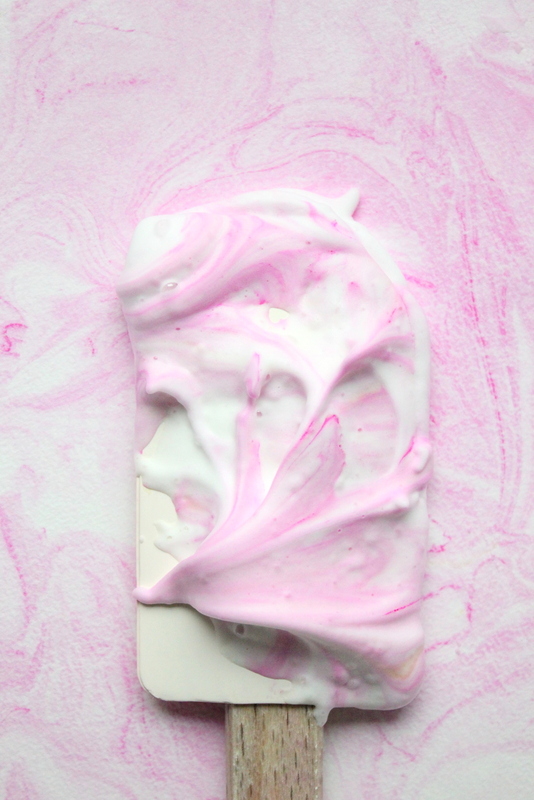 Together they created a subtle marble and the best part: the paper smelled amazing due to the scent of the shaving foam. It has a powdery smell and will stay on the paper for a long time. It reminds me of spraying perfume on love letters and how intimate a gesture that can be. So let’s get to it and make something special for the one you love! 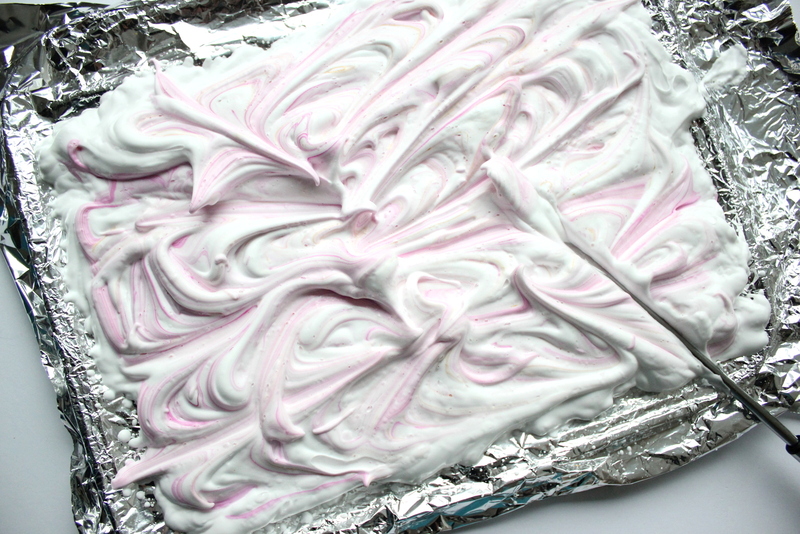 Spray shaving gel into the baking dish or on some aluminium dish/foil. Make sure that the surface is large enough for your sheets of paper (or envelopes) to be laid on top in their entirety. 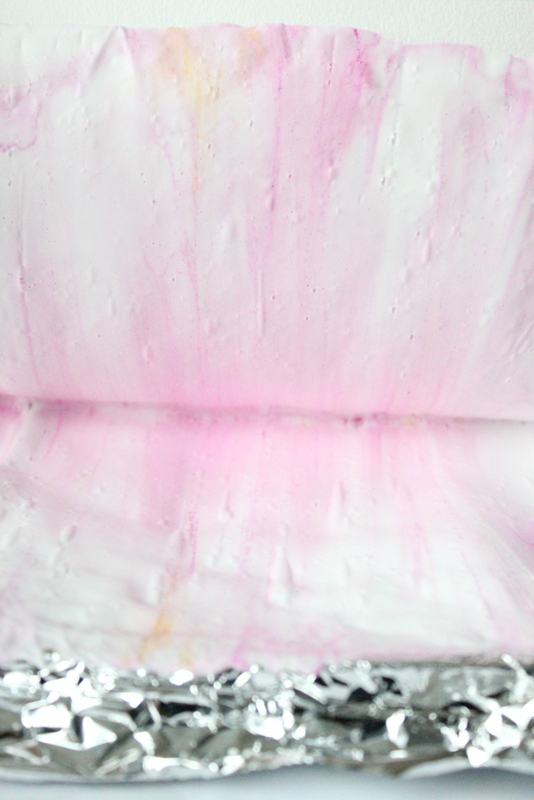 The shaving foam should be high and dense enough for you not to see the bottom of the tray through it. It should have no holes and be evenly distributed. 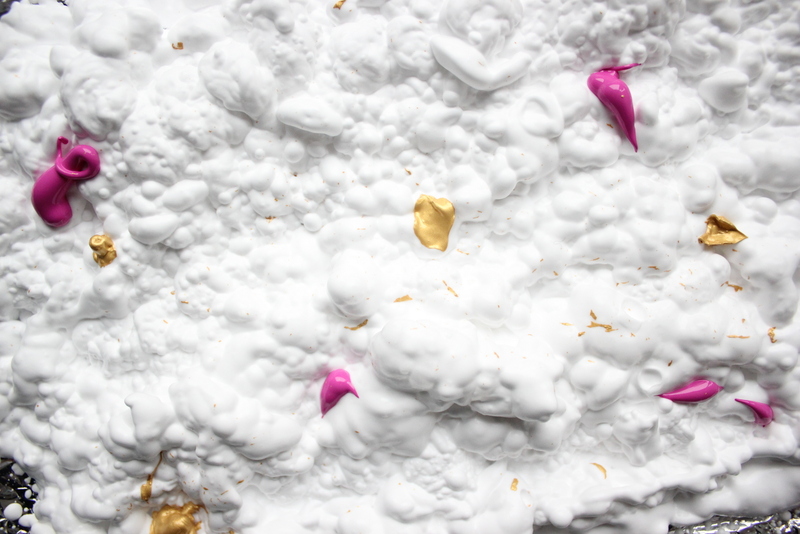 Now you can disperse your favorite shades of acrylic paint on top of the shaving foam making small dots. I recommend using only one or two shades at the most, as more than that will create too much of a blurred color. If you do use more than two shades, make sure you leave plenty of space between the dots so as to have enough white space. 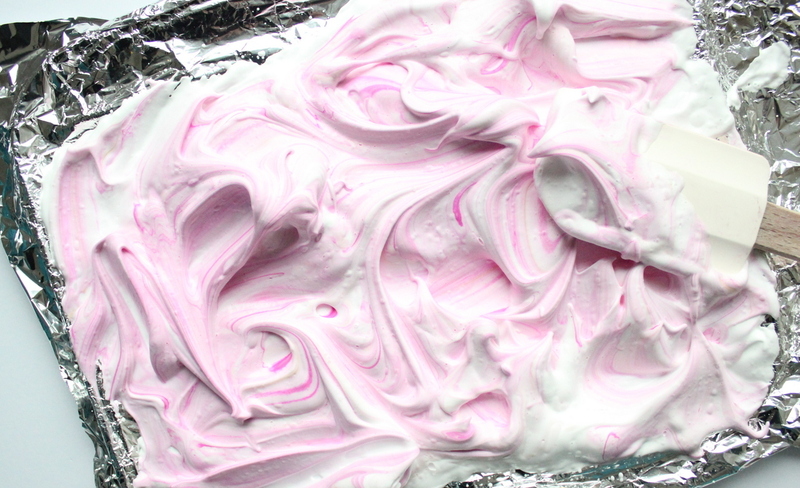 Next, stir the shaving foam using a thin stick or fork. Don’t worry about it being even, the color will work its magic on the paper. The less you worry about it the better it will turn out. 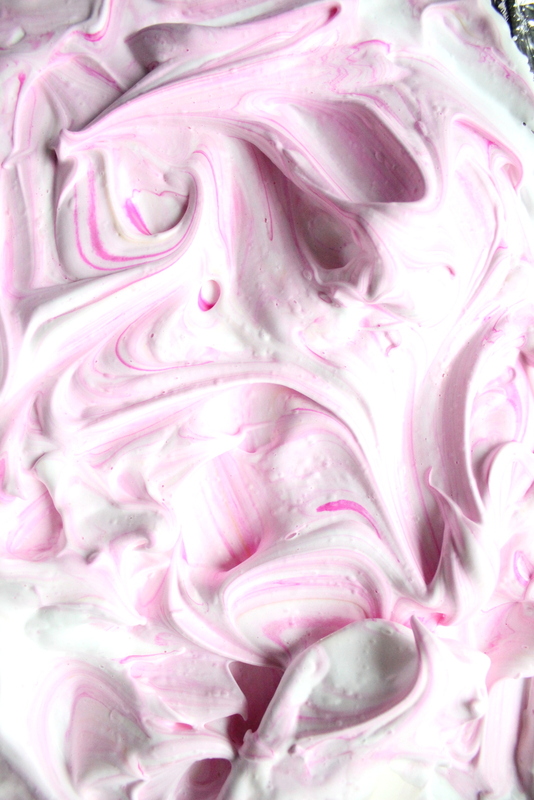 Now use the silicone spatula to mix the color under the foam even more. This will create the base color. Don’t overdue it though or you’ll risk losing the marble effect. You can always add acrylic paint if you feel like it is missing intensity. Cut your piece of paper to the desired size. 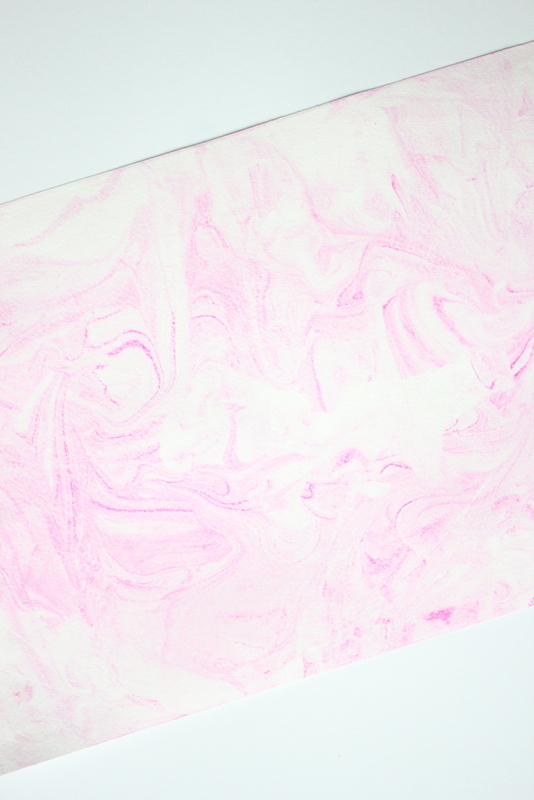 You can use this marbled paper as wraping paper, letter paper, envelope covers, etc. Put the paper on top of the shaving foam and delicately press it down in order for the sheet to be evenly touching the foam underneath. Some of the foam will spill over the edges. If you only want one side of the paper marbled, you’ll need to tape it off. Don’t worry about shaving cream spilling, it can all be wiped off and doesn’t leave any stains on your skin. 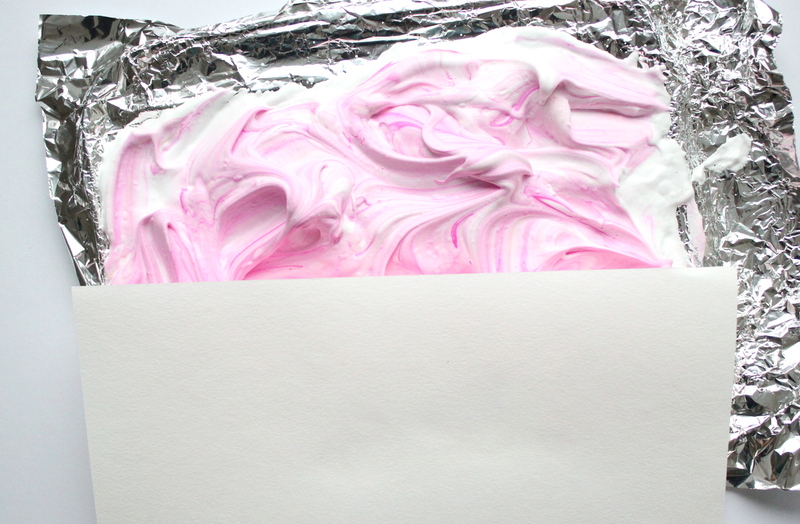 Just put a plastic cover under your baking dish or foil if you don’t want to take any risks. Let the paper soak up the foam for a few minutes. 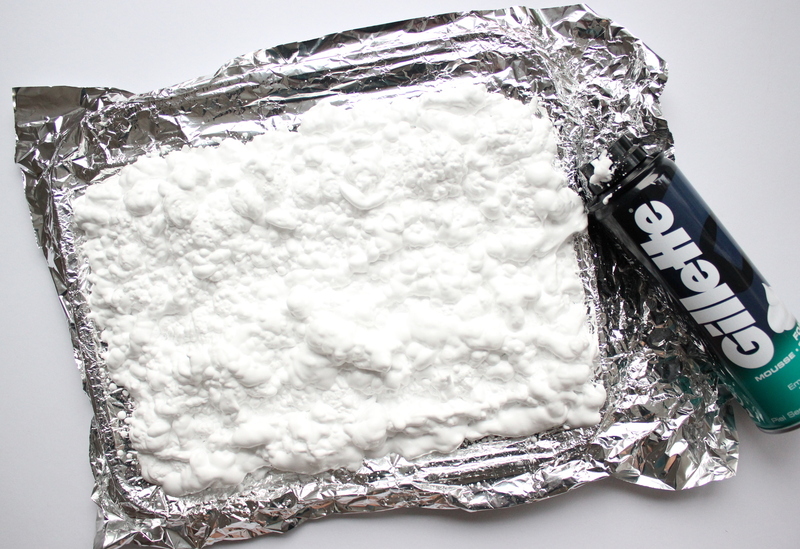 Carefully lift the paper off the foam starting from one side to the other and put it on a sheet of paper towel or foil, foam side up. Take the ruler and put it down on one end of the sheet. Slowly push the ruler to the other side, pushing the foam away. You might have to repeat until there is no foam left on the paper. Put the excess foam back into the baking dish or onto the foil. The mixture can be used multiple times, as long as the foam holds up (usually an hour or so). Put the paper sheets aside to dry. 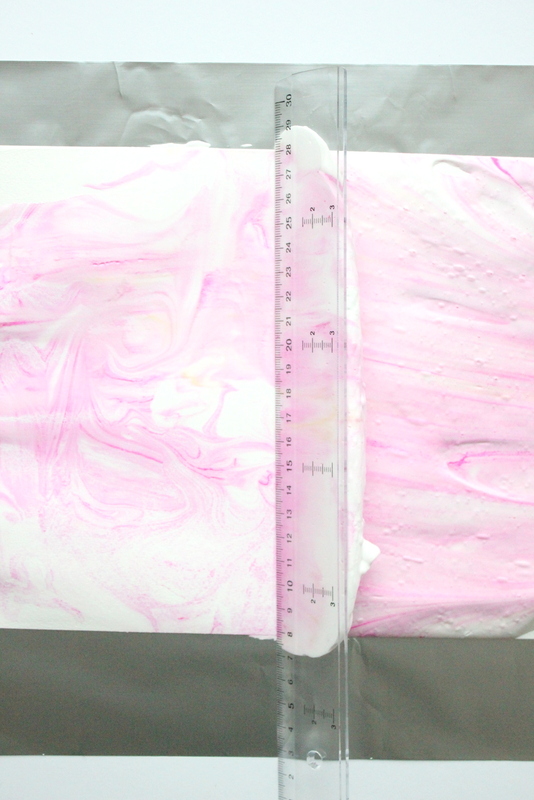 You now have beautiful diy scented marbled paper that will put a smile on every one’s face when they are presented with it. Valentine’s Day has never looked and smelled this lovely. The fact that you can say “home made with love!” makes this the perfect gift for a special someone. Happy Valentine’s Day from Reveries of Style! 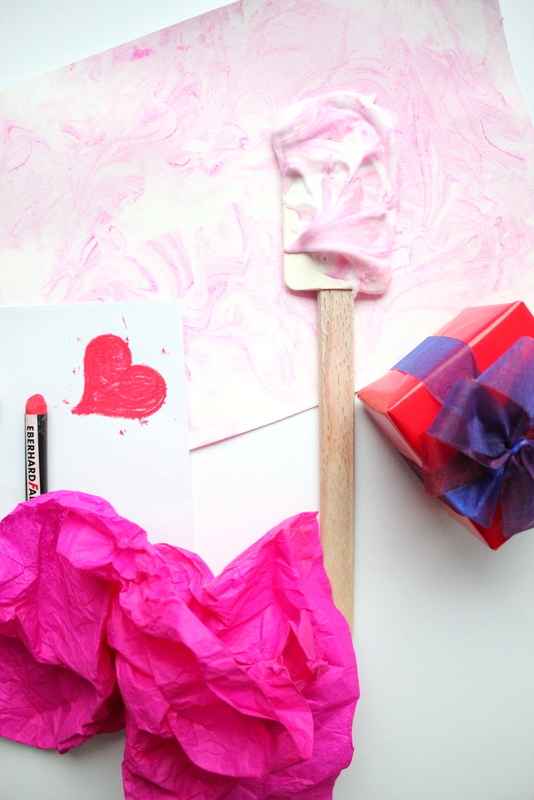 3 Responses to DIY scented marbled paper: Show your love this Valentine’s Day! Wow, what a great idea. Yes, you can always try to tweak this. I would probably opt for an unscented foam in that case and see if the oil mixes with the foam first. Let me know how it goes! Good luck!